Guernsey issues, including Commemoratives, Definitives, Postage Dues and Regional issues. Jersey issues, including Commomoratives, Definitives, Postage Dues and Regional issues. IOM issues, including Commomoratives, Definitives, Postage Dues and Regional issues. We accept payment for Auction goods via our Paypal account. Please ensure you include a note with your Ref. No. and the Sale No. (for example C15, Sale 25). Open the Paypal web page here. 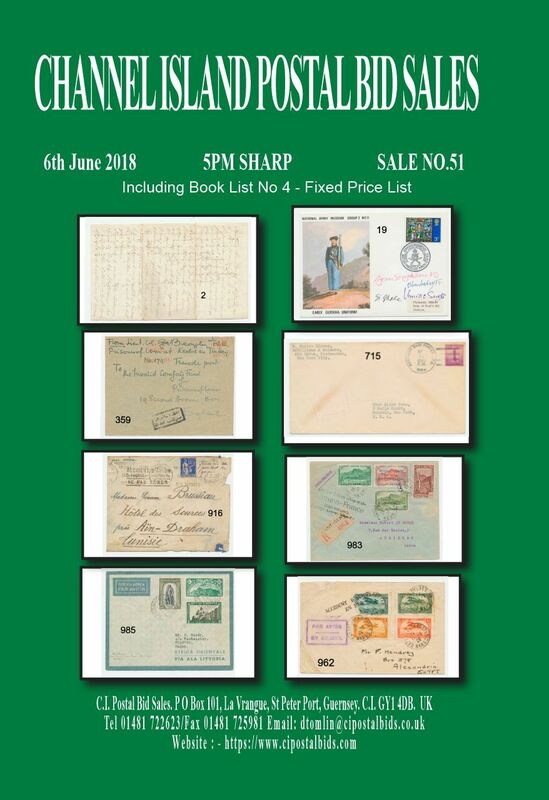 Postal Auction catalogues are produced several times a year, with many many lots of Postal History ranging from Collections, World War, Maritime, Flight, CI Postal History, GB, British Commonwealth and many more catagories. To view the catalogue in PDF format, please click on the link. Scans are available for lots not pictured, by request to the above email address.